This book’s raison d’être is the 110 black-and-white photographs it contains. Readers of this review should know that it is co-authored. David Lord’s comments are the plain text and my words (Helen V Hutchings) are in italics. Moreover, in the interest of full disclosure, it must be noted that David and I knew Strother MacMinn, the man whose photographs are featured, during his lifetime. David Lord knew MacMinn first and longest, having been a student at Art Center College of Design, taking classes from and befriended by MacMinn during the 1960s, then subsequently as industry peers. Helen Hutchings knew Mac for the last 25 years of his life, but after his 1998 death, learned and documented considerably more about him as part of work as a researcher/historian. And thus I was tapped to edit and fact check the introductory words of the co-author/publisher of this book, but had no prior knowledge of the content of any of the interior pages, neither the photos selected and featured, nor the captions. I like this book despite a few oversights, errors, and uncorrected typos And while I’m not all that knowledgeable about the dry lakes, to me those pages look very much like a black-and-white Tom Fritz treatise. (For readers who do not recognize the names of either Fritz or reviewer Lord—both are accomplished fine artists and members of AFAS, the Automotive Fine Arts Society. Much of Fritz’s art shows iconic dry lake and hot rod scenes, while the subjects of Lord’s work are more open wheel race-oriented.) I reacted to the images esthetically rather than to what was hot rodded or run at the dry lakes. There are some great machines—hot rods, customs and dry lakes runners which include many with those wonderful belly tank bodies—that were thankfully recorded for us to see today because Strother MacMinn was exploring in and around the LA area during the 40s and 50s, composing beautiful shots. That said I somewhat wish the writing, the captions, had been done a bit differently because I’m not sure either author knew the photographer all that well. Mac was pretty introspective, not in a brooding sense but more reflective. He was always careful with his words, quiet until he was sure, with a degree of sophistication. He always took the time with his students. And, with this time, there was always a time to work and a time to play. It’s nearly impossible I suppose, after the fact, for a book of his photographs to clearly reflect that his work, his hobbies, his friends, his photography, his students each occupied the separate—yet interrelated—places within his life that I am confident each did. 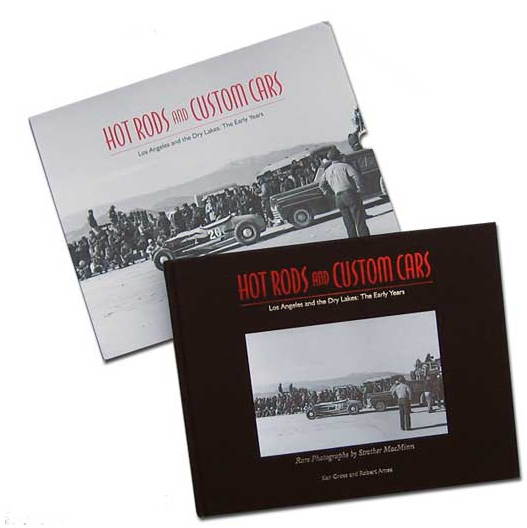 To me, the captions in this book seems like what is true—they were written by a fan of the photographer, a hobbyist/expert of historic (and modern day) hot rodding and then another enthusiast who was lucky enough (for him and for us) to acquire these photos. I think the entire book is a wonderful salute to Mac. I could look at the photos forever! An individual’s focus or interests will dictate how the book is perceived. Those who knew Mac recognize much of “him” in the images. Today’s hot rod and dry lakes enthusiasts are elated at finding period photos that for the most part have never been published. And wonderful as Mac’s photos are, credit too goes to a company only mentioned in passing on the masthead page. Cirrus Digital Imaging is owned/operated by Phil Bard, himself an Art Center College grad and thus he too was acquainted with MacMinn, although never as student for MacMinn did not instruct any classes in the photography-major syllabus. The scans were accomplished very high res on a drum scanner and digitally corrected ensuring this best-possible presentation on the book’s pages. Thus David is absolutely correct, you can look at the photos in this book “forever” especially if you are not merely looking at whatever is the central “subject” but at all the rest of the detail around and behind. However, in addition to those wonderful images, there is the text—and it too is worth the read. It was written by Ken Gross who is a professional journalist but also a hobbyist with a particular penchant for, interest in, and knowledge regarding hot rod history. So he’s been able to identify vehicles special then and revered now. And he consulted with others to help augment the knowledge base. Happily too, the book is indexed so it has historic research value to go along with its esthetic pleasures. And it is handsomely presented in its own slipcase as shown at the top.